La traduction est un art. Le 4 avril, le ministère de la Culture et de la Communication, en présence d’Andrea Zlatar Violic, ministre de la Culture de la République de Croatie, a dévoilé l’avant-programme du Festival de la Croatie en France (septembre - décembre 2012). Deadline for entries: March 10, 2012. This an exciting new course on software and games localisation run in collaboration with the Humanities department at Imperial College London, to be delivered by e-learning spanning a total of 11 weeks. Private users have adapted quickly to the web 2.0 revolution. They’re communicating in a brand new way — social networks, video sharing and blogs are all part of most people’s daily life. Now it’s time for businesses to benefit from the opportunities offered by collaborative Web services. October 21st 2008, Yoolink will launch a new 2.0 service for small and middle-sized companies. Summary: Tourism Overview Foreign tourist arrivals were up a strong 7.5% year-on-year (y-o-y) in 2007 to 9.3mn arrivals, resulting in one of the best tourist seasons on record in Croatia. Latest data for the first two months of 2008 show foreign arrivals up an impressive 21% y-o-y to some 126,000. This reflects to some extent the strong growth rate, albeit a lower 13% y-o-y, recorded over the same period in 2007. Beckhoff Avtomatizacija commenced sales business in Slovenia in the middle of May 2008 with the opening of a new branch office in Medvode in North Ljubljana. The distribution partner for Croatia is also new. Beckhoff has thus further expanded its position in Central and Southern Europe in order to increase customer acquisition in the former Yugoslavian states. Mit der Eröffnung einer neuen Niederlassung in Medvode, im Norden Ljubljanas, hat Beckhoff Avtomatizacija Mitte Mai 2008 seine Vertriebstätigkeit in Slowenien aufgenommen. Ebenso neu ist der Distributionspartner für Kroatien. Damit hat Beckhoff seine Position in Mittel- und Südeuropa weiter ausgebaut, um so verstärkt Kunden in den Ländern des ehemaligen Jugoslawiens zu gewinnen. FRANKFURT - Andreae-Noris Zahn AG (ANZAG)(GER:ANZ)(FWB:FANZ) yesterday signed a share purchase agreement to acquire a 92-per-cent stake in Lithuanian pharmaceutical wholesaler JSC Armila. "By acquiring Armila, we are expanding our business in foreign markets, and so reducing our dependency on our home market of Germany, and our vulnerability to cyclical fluctuations here," says Thomas Trumper, Chairman of the Board of ANZAG. Frankfurt - Die Andreae-Noris Zahn AG (ANZAG) übernimmt 92 Prozent der Aktien des pharmazeutischen Großhändlers JSC Armila in Litauen. "Mit der Akquisition von Armila bauen wir unsere Auslandsaktivitäten aus und reduzieren so unsere Abhängigkeit von Schwankungen und Entwicklungen im deutschen Heimatmarkt", sagt Dr. Thomas Trümper, Vorstandsvorsitzender der ANZAG. Pedersen & Partners, a leading international executive search firm, announced today that it has acquired 100% shares of the leading Croatian executive search firm Alter Modus. Alter Modus will change the firm’s name to Pedersen & Partners, and the current Pedersen & Partners subsidiary will be phased out. The owner and manager of Alter Modus, Sanja Brkic-Fakles (sanja.brkic-fakles[at]pedersenandpartners[dot]com), will join Pedersen & Partners along with her team and business activities. As of today, Ms. Brkic-Fakles is the Country Manager for Pedersen & Partners, Croatia. Teams from both companies are working closely to ensure that during the integration process the existing clients continue receiving high quality executive search service. 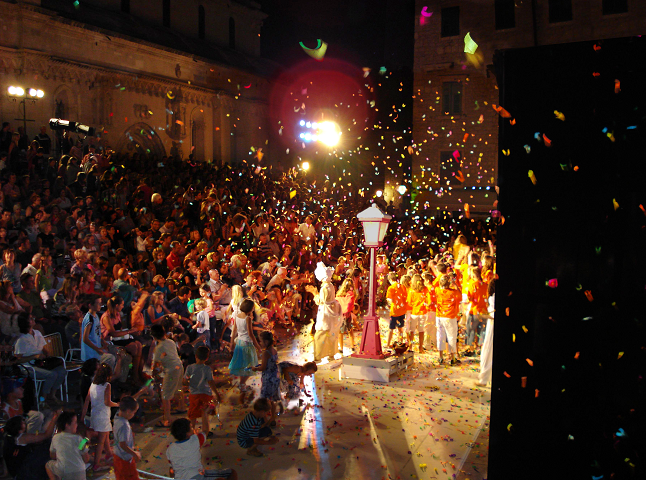 Comme chaque début d'été, le Festival international des enfants ouvre ses portes dans la cité dalmate de Šibenik. Durant deux semaines, la vieille ville médiévale et Renaissance se dédie aux tout-petits et aux enfants, leur proposant un florilège de spectacles et de chants. Les professionnels et les amateurs viennent de toute l'Europe pour participer ou assister à l'événement culturel de la région. Accession to the EU in 2007 has been the major driver of change in Bulgaria of late, and the country is working to come on line with its new EU neighbours on the political and economic front. The country has seen consistent growth in foreign direct investment (FDI) over the past three years, and both the industrial segment and tourism look particularly strong. The banking sector also looks set to continue to enjoy good health, as the injection of EU funds into various programmes will require co-financing from banks. A tough agricultural season in the summer of 2007 led to rising prices and climbing inflation, though the government is confident that domestic measures aimed at boosting the supply side, as well as continued investment, will help cool off the economy in 2008. Welcome to the Enterprise Europe Network, your gateway to competitiveness and innovation. Wherever you are in Europe, you can get access to all the information you need to develop your business and find the right business partners. ZAGREB - U splitsku zračnu luku danas je sletio prvi od četiri zrakoplova Dash 8-Q400 kanadskog proizvođača Bombardier Aerospace, kojima će nacionalna zrakoplovna kompanija Croatia Airlines zamijeniti svoju flotu kratkog doleta, izvijestili su iz Croatia Airlinesa. TORONTO, ONTARIO : Bombardier Aéronautique a livré le premier de quatre biturbopropulseurs de ligne Q400 commandés par Croatia Airlines, de Zagreb, en Croatie, dans une transaction annoncée le 4 juin 2007. Croatia Airlines détient des options sur deux autres Q400. L'avion a été reçu et accepté par Vanja Roller, vice-présidente exécutive, entretien et ingénierie de Croatia Airlines au cours d'une cérémonie tenue au centre de livraison de Bombardier Avions commerciaux, à l'aéroport international Lester-B.-Pearson de Toronto. "C'est le début d'une nouvelle ère dans l'évolution de Croatia Airlines, a déclaré M. Roller. Nos Q400 de 76 places nous permettront d'harmoniser la capacité sur des liaisons où la demande ne justifie pas l'utilisation de nos plus gros avions à réaction. Grâce à sa vitesse, nous pourrons également déployer le Q400 sur des liaisons plus longues en limitant les temps de vol supplémentaires. Tout ceci est sans parler des excellentes caractéristiques écologiques du Q400." TORONTO, ONTARIO : Bombardier Aerospace has delivered the first of four Q400 turboprop airliners ordered by Croatia Airlines of Zagreb, Croatia in a transaction announced on June 4, 2007. Croatia Airlines holds options on two additional Q400 aircraft. The aircraft was accepted by Vanja Roller, Executive Vice-President Maintenance and Engineering of Croatia Airlines during a ceremony at the Bombardier Commercial Aircraft delivery centre at Toronto's Lester B. Pearson International Airport. Icograda endorses the fifth edition of the Croatian Design Exhibition, organised by the Croatian Designers Society. The Exhibition, along with the accompanying publication and National Designer Convention, will present a survey of the best designer works created in Croatia in last two years. The Exhibition, with related events (exhibition of "CDS Prize for Lifetime Achievement 2007" awarded designer and convention), tries to establish an appropriate platform for an open dialogue on the quality of design and designers in Croatia today, to improve professional standards and to give immediate insight into the changes of current designers' production that have taken place in the period under review. At a board meeting on April 15th 2008 management of Manas Petroleum Corporation reported that all projects reached their milestones on time and are within the budget. Goldman today launched the UK "conviction calls" list to highlight the best ideas of its equity analysts across all sectors. The recommendations will run alongside its pan-European stock selection, which has been in operation since April 2006.